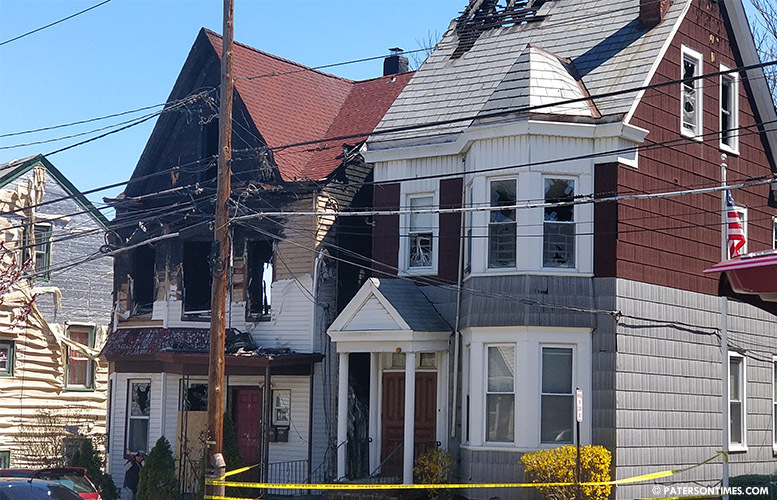 The large fire on the Northside of Paterson displaced 11 people from their Hopper Street house early Saturday morning. Firefighters found the building engulfed in flames. Firefighters battled for three hours to contain the blaze. Deputy fire chief William Henderson said the fire came in at 4:39 a.m. He said the fire from 42 Hopper Street spread to a neighboring — 40 Hopper Street – vacant building. No civilian injuries were reported. There was an early report of a firefighter injury; however, the firefighter was not injured while battling the blaze, said the deputy chief. The flames left the second floor of the two-story occupied building badly damaged. Flames badly damaged the roof of the vacant building. Sidings on a third building, 45 Hopper Street, appears to have melted due to the heat from the fire building. Both buildings’ utilities were cut, said Henderson. He said the cause of the fire remains under investigation. The displaced residents are being assisted by the American Red Cross.